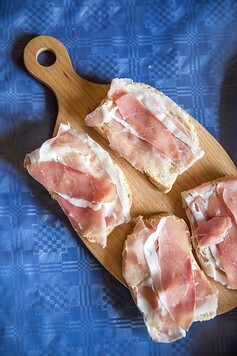 The Best Things to Do in Parma: Prosciutto, Parmigiano, Perfetto! As part of our visit to Northern Italy, we had the opportunity to see Parma. I didn’t know much about the town except for the obvious: that its nearly synonymous with Parmesan cheese! What I discovered was great art, music, history and culture. Here’s what we found, plus travel tips for all the best things to do in Parma, Italy! 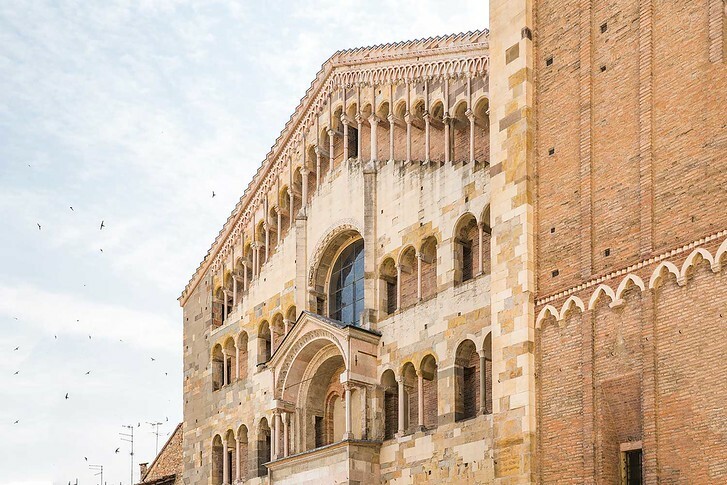 Parma is a pretty riverside town that has seen a lot since it was built by the ancient Romans in 183 BC. Due to its strategic location along the ancient Via Aemilia road, the city flourished from trade. After a dark period when the Ostrogoths destroyed the town, the city was rebuilt in the Middle Ages and ruled by a series of powerful bishops (evident today in the many historic churches of Parma). Struggles between the Holy Roman Empire and papacy eventually gave way to a series of powerful local lords, the famous Duchy of Parma. 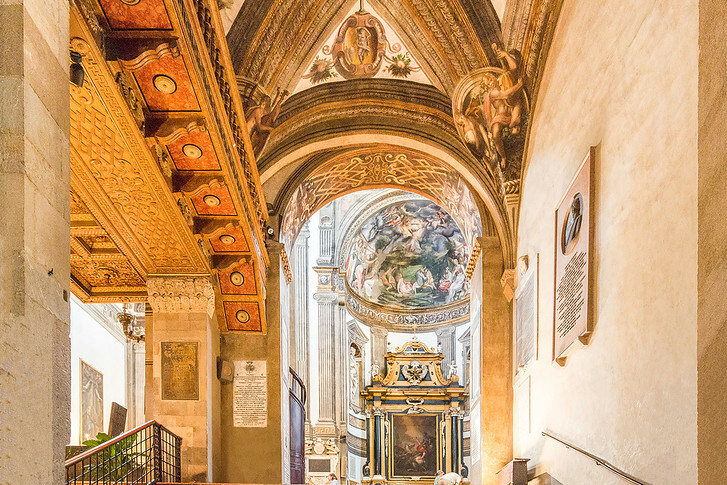 Today, there’s lots to see and do in Parma, from the beautiful Baptistry to the National Gallery. It’s a really nice city to explore in spring and summer, as it’s quite walkable and the locals love biking around. 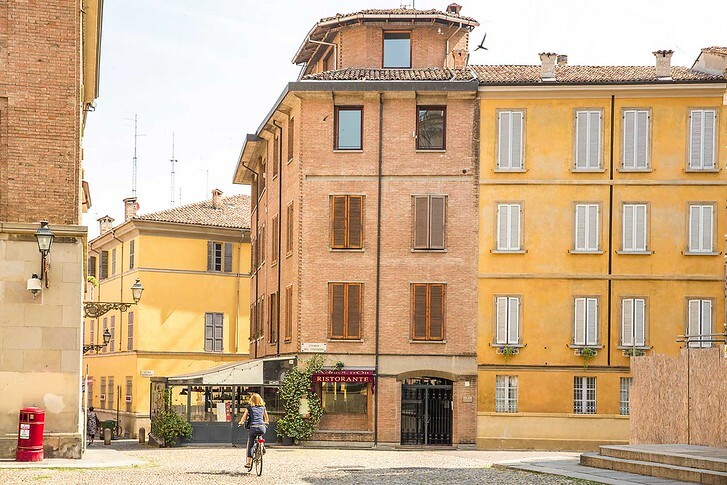 You definitely won’t go hungry here – Parma has too many amazing restaurants and cafes to count! Parma has pretty much always had a reputation for great food. Here, the local culture is food, food and more food. 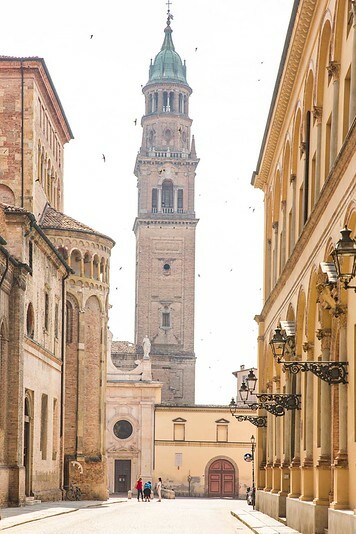 Nestled in the fruitful Po valley, Parma is home to thousands of local Italian farms which produce many of Italy’s famous delicacies: parmigiano reggiano, balsamic vinegar and prosciutto di parma. Also located here? The famous Alma Cooking School and Barilla Pasta Company! 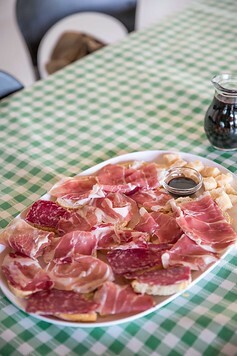 The number one thing to do in Parma, in our opinion, is to eat! From traditional restaurants to specialty produce markets and fine dining, it’s nearly impossible to find a bad meal. Parmigiana Reggiano is produced in just a couple provinces of Emilia Romagna. Here at the fertile Po Valley, over 4,000 dairy farms produce the king of cheeses: parmigiano reggiano. Production is tightly regulated by the Consortium, which maintains strict standards on everything from the cows’ diet to the curing process. We toured one of the caseificio (dairy farms) to see the entire the production firsthand! My favorite part was seeing the maturation rooms, where the cheese wheels are laid to rest on wooden tables. In one giant room, I counted nearly 2,000 wheels of cheese! Wheels of Parmesan are branded with the year and month they were produced, so that you know exactly what you’re eating. As the outside of the cheese dries, it forms a natural crust. The final product is aged anywhere from 18 months to 3 years, but ‘peak perfection’ is generally considered to be 2-year old Parmesan. Did you know seasons can affect the taste? Winter Parmesan is said to have a deeper flavor than summer parmesan! 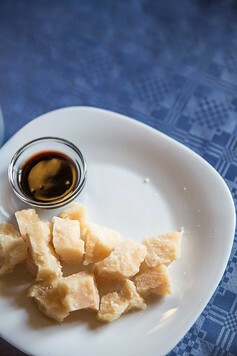 After tasting Parma’s dry, crumbly cheese, chances are you’ll need something to wash it down with! 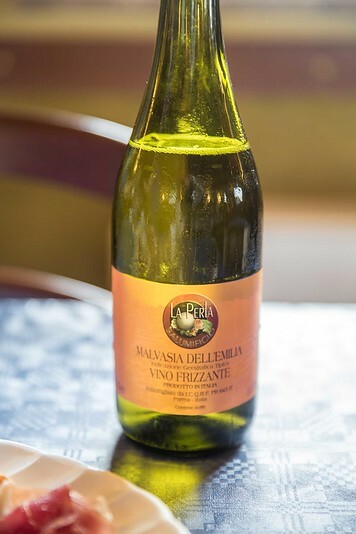 Try Lambrusco, Parma’s fizzy red wine that’s the local drink of choice. Made from grapes grown in vineyards throughout Parma and Modena, Lambrusco is really easy to drink as it’s low in alcohol. It tastes just like a sparkling red wine, and can vary from a light pink shade to a deep red. I can only drink red wine these days (white wine tends to give me an immediate headache because of the high sugar content) so I really liked trying a fizzy red! Back when I could handle more than 1 drink, my favorite white wine was a sweet, crisp Riesling or glass of bubbly. Lambrusco was a nice alternative to try! In the main square of the Old Town, you’ll find a 12th century Romanesque cathedral, an octagonal Baptistery (distinctive not only for its shape but its pink marble facade) and San Giovanni convent. If you get lost walking around, just look up for the huge flocks of birds. Chances are, they’re flying to and from one of these 3 buildings in the Piazza. The cobblestone area is incredibly peaceful – even in peak summer! We went inside Parma Cathedral for a peak (mostly to avoid the heat) but we were really impressed inside. There are vivid frescoes decorating the ceilings that are still bursting with color today. Later I found out that the famous Assumption of the Virgin fresco on the dome of the cathedral was painted by famous Renaissance painter Correggio, who came from Parma. To the right of the cathedral is Parma’s main baptistery. It’s actually much taller than the Parma cathedral! The exterior is made of a pale pink marble and inside, each octagonal wall panel contains its own fresco. Above these, there are paintings of famous Italian figures. Stop in to admire the arches, marble statues and painted religious icons – both inside and out! On the banks of the river Torrente, you’ll find a huge complex with beautiful grounds that contain a ducal palace and court. Although first built in the late 1500s, it was never completely finished so you’ll see some beautiful facades and archways… and then some plain stone buildings. Here is also where you can visit the National Gallery and Teatro Farnese. The later is a beautiful baroque style playhouse in Parma almost entirely made of wood. It was built by a duke of Parma and Piacenza in 1618 to commemorate the passing of Cosimo II de Medici on his way to Milan. The two powerful ducal families were tied by marriage back then. During the theater’s inaugural event in 1628, Italian composer Monteverdi was frustrated by the structure’s acoustic problems and had to put his orchestra in a pit below the stage. This was before Wagner established the modern practice of designing an orchestra pit to sit below the stage! Right next door you can find Parco Ducale. Parma has many beautiful parks but none as impressive or large as this grand Garden. It was originally built as the formal gardens for Duke Ottavio Farnese in the 16th century, with fruit trees, splashing fountains, sculptures and a pretty oval lake with swans. The layout and landscape here is quite pretty! It’s the perfect place for a picnic, evening stroll or just a family day with kids. 1 | NH Parma – This business hotel is conveniently close to both the Old Town and train station. Free parking underground for those with a car and breakfast is also included. Rooms at the NH Parma are quiet, inexpensive and modern. 2 | Starhotels du Parc – Located in the Parc Ducalle, this spacious hotel is decorated in a classic, traditional style with plenty of marble, wall paper and portraits – it feels a bit like an old luxury villa. Starhotels is slightly farther out from the historic town center, but still within walking distance. Rooms are large and comfortable! 3 | Mercure Parma Stendhal – The Mercure is a comfortable hotel with a great location. It’s an easy 5 minute walk from the train station and another 5 minute walk from Parma’s town center. Rooms are clean and comfortable while the self service breakfast is great. If you plan to see all the main sites (cathedral, baptistery, etc) stay at the Mercure. Parma is best explored in spring (March to May) and fall (September to November), once the crazy heat dies down! Most airlines offer nonstop flights from New York to Milan. Set a flight alert here to catch upcoming deals. From Milano Centrale train station, you can hop on a 1 hour train to Parma. We used Rail Europe to look up the train schedules and book our tickets. If you want to explore the production farms that make parmesan cheese or prosciutto, you’ll most likely have to rent a car or book a tour as they are located outside the main city. 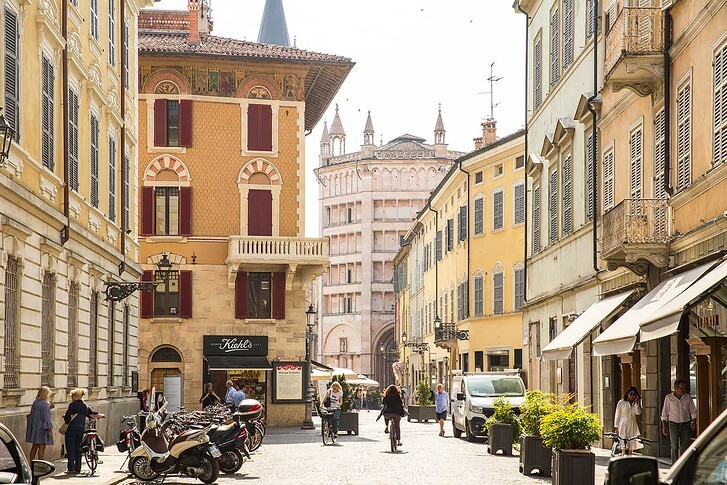 In 2015, UNESCO named Parma a “Creative City for Gastronomy,” in recognition of its rich culinary history. Can you believe it was the first city in Italy to get such recognition? 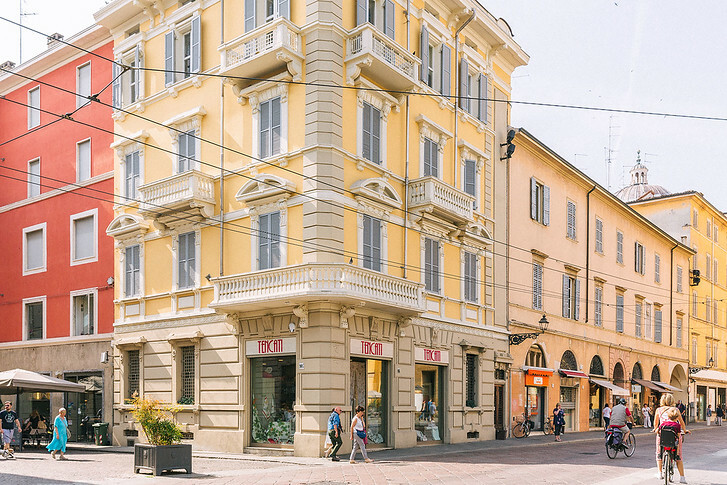 Parma, like Bologna, is a great city to make nearby day trips since there are a lot of fun activities to do in around the town. 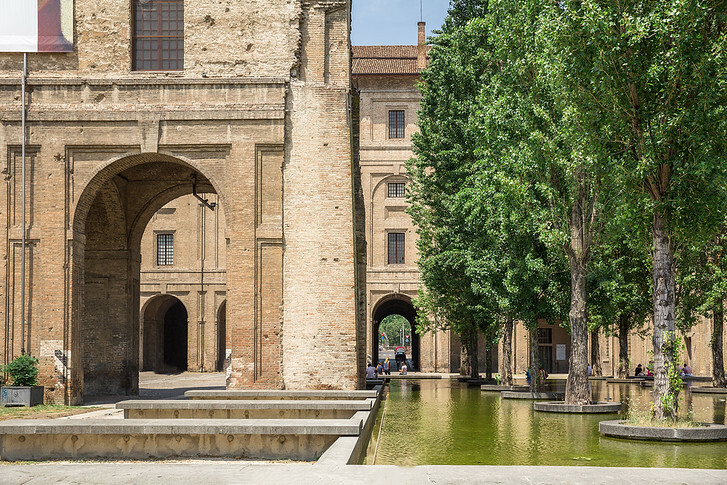 Parma is home to one of Italy’s oldest universities and is a hub for engineering and design. Car lovers will want to tour Ferrari, Maserati and Lamborghini which are all headquartered in the region. Also don’t forget a visit to the dairy producers and parma ham factories nearby! 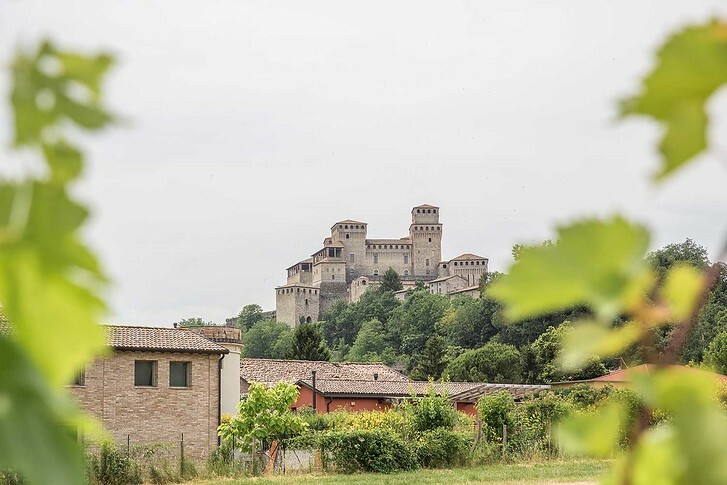 Italy recently named Parma it’s ‘City of Culture’ for 2020, so now is a perfect time to visit!